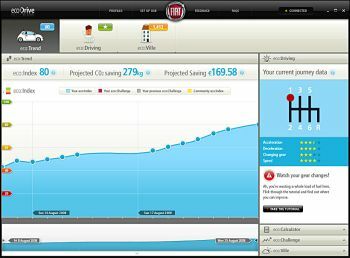 “ecoDrive” is a software application that can be installed on your computer and is available from today on www.fiat.com/ecodrive (there is also a video dedicated to the product on this site). At the Paris Motor Show, the Managing Director of Fiat Automobiles, Lorenzo Sistino, presented “ecoDrive”; it is an innovative system that allows drivers to gain better insight into how their driving style influences their consumption and emission of pollutants. As you are driving your car, “ecoDrive” processes in detail all the information relating to the vehicle’s efficiency and your driving characteristics. Thanks to the versatile Blue&Me’s USB port, all the data is transmitted via a normal USB key and can, therefore, be “read” on a computer at a later date. In fact, the user can carefully analyse consumption and emission on each journey they make (ecoIndex) and receive advise on how to drive in order to create less impact on the environment. In fact, thanks to a series of progressive tutorials, you can improve your score: just think that drivers who are more conscious of their “eco-responsible” driving can expect to improve their driving style by 15%, and that means: reduce CO2 emissions by 15% and see an annual saving in fuel of between 120 and 200 Euro. Furthermore, “ecoVille” has been created specifically for Fiat’s “ecoDrivers”, an on-line community where everyone can share interests and their commitment to an eco-responsible way of driving by accessing the site www.fiat.com/ecodrive where there is also a video dedicated to the “ecoDrive” system. 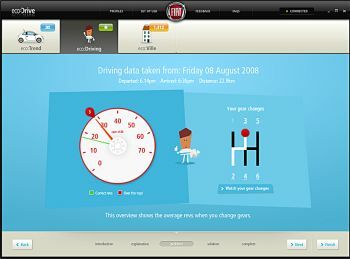 Fiat 500 and Grande Punto are the first Fiat Group vehicles to make use of “ecoDrive” and, as of today, will be available for downloading from the site and installed at no extra cost. In 2009, the system will be extended to the rest of the range equipped with Blue&Me. Lastly, thanks to a contribution from users, the “ecoDrive” application will be updated to make it even more useful. “ecoDrive” is a Blue&Me evolution, the platform developed by the Fiat Group Automobiles in conjunction with Microsoft that has already earned a great deal of recognition and reached a quota of 500,000 pieces installed in the various Group’s models in about the last two years.